From the customer’s perspective, Black Friday is an enjoyable shopping marathon; it is a great opportunity to buy holiday presents at a huge bargain. For the business world, it is the busiest season of the year, when marketing uses all the magic it has to increase profit, engage new audiences, and to awaken inactive customers. Black Friday through Cyber Monday is the period when the brands are engaged in a grave competition to be heard. The efforts go far beyond simple dropping of the price to result in impressive ROI. The successful BFCM campaign implies a number of tactics. In this post, we would like to share the best practices of popular brands and provide some tips for boosting sales rates. Create a sense of urgency just like Amazon did — with the cunning use of Available and Missed deals of the day. Give some tips about preparation for Cyber Monday, and outline what should be expected. Amazon is one of the brands that used social media and on-site activities, significantly amplified by emails. Apple is the embodiment of confident and plain promotion. Basically, the brand is being true to its form, where minimalism, clarity, and precision are distinctive features. Its Black Friday campaign is no exception to the rule. Apple is so huge, that a single notice on their home page is enough. 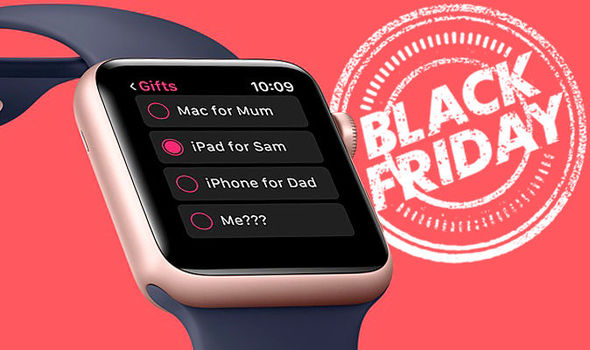 Black Friday is the best time to use appealing offers to grab attention. 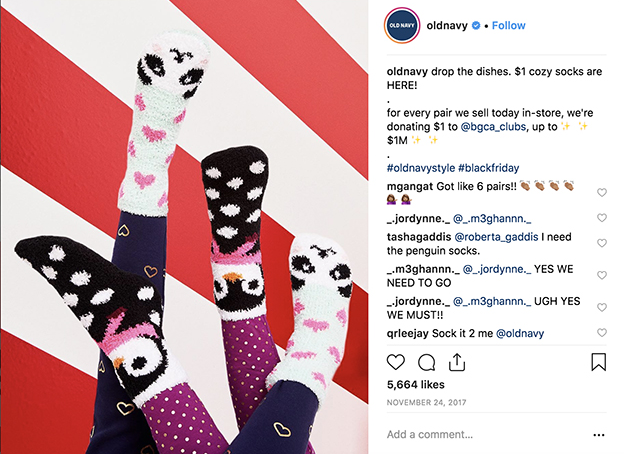 Old Navy resorted to charity donation; for each pair of socks sold a dollar is donated to a charitable organization. During shopping season customers prepare for the holidays, they are already in a festive mood; Christmas is approaching, it is the time of magic kindness and care about each other. In this case, charity is charming and it is an effective approach for creating brand awareness. Barnes & Noble is a respected brand that has existed since the late 19th century. The marketing department must have sat and thought: what would make our customers happy? And they came up with a rather intriguing twist that no company’s client would ever want to miss — editions signed by the authors. This tactic is great because having your copy signed turns the purchase into a personal gift. And personalization sells. 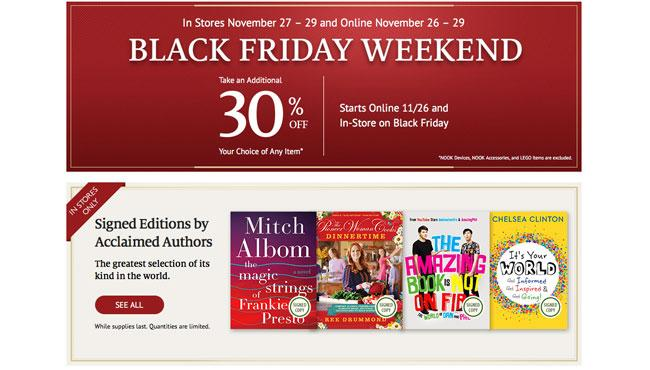 By the way, the spin that works during Black Friday doesn’t have to be limited to holiday sales. If you look at this Black Friday marketing campaign, you can sense the focus on the holidays. The colors, glitter, and the mood, in general, invites the customers to spend these days looking for the best gifts for the dearest people. In addition, GAP is famous for wordplay in sales pitches, which is a good thing; people appreciate the creative approach. The majority of online stores prefer full Black Friday ammunition. It is a good idea to optimize the website using visuals. Campaign banners are more likely to engage customers when they are fun to watch. As a result, the site visitors are expected to stick around a bit longer and find out what those jumping flashy deals are all about. Make your announcement clear as day. You are free to resort to word games, play with email subjects or think of a design that will stand out from the crowd. At the same time, the message of the announcement must be simple: what it is, how it works, how to buy it. Make it fun. Animation really works. People are more attracted to entertaining campaigns. Whether it is motion design, flash, or gifs — they are to be in line with the tone of the brand. The most essential information on the offer should be kept above the fold. Offer a sneak peek. It’s a well-known fact, that preparation for Black Friday and Cyber Monday has to start way ahead of the shopping season because many shoppers begin early. Sometimes the most valuable thing about the holidays is the anticipation. Warm this feeling up. Create a gif or a video about the products on sale to build anticipation, and to engage customers long before BFCM starts. The video must be actively promoted. Use native advertising. Native advertising has proven to be effective simply because this tool is better received by the users. The native ad is the bridge to the target audience. We prefer to match these words with the statistical data: 53% of customers view native ads more than banner ads. Buyers seem to realize that native ads are the 2.0 version of a traditional display which organically blends into feed without interrupting it. Each brand has its own identity, and Black Friday is the perfect chance to be creative in a unique way. Creativity is great, no doubt about that. However, choosing the right channel is a very important aspect, and native advertising is the real deal.